Strategy analytics has reported the Global 4G LTE connections to grow from 238 million in 2013 to 2 billion in 2018. 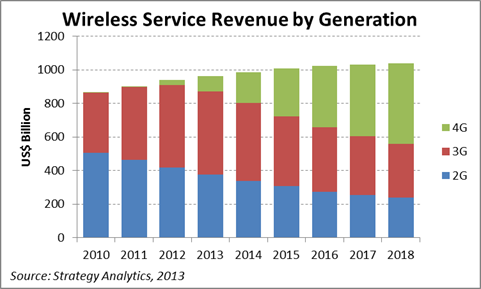 The report named "Worldwide Cellular User Forecasts, 2013-2018" predicts that LTE networks will account for almost half of mobile service revenue globally by 2018, up from under 10 percent in 2013. "Even in 2014, the US, Japan and South Korea will remain the dominant LTE markets, but all eyes will be on China," comments Phil Kendall, Director of Strategy Analytics’ Wireless Operator Strategies service and author of the report. "With TD-LTE licenses now awarded and China Mobile particularly keen to expand and launch its already large pre-commercial network, China should be the catalyst driving lower-cost 4G devices into the global market over the next two years." Susan Welsh de Grimaldo, Director, Wireless Operators & Networks, added "Mobile operators are increasingly looking to LTE for value creation in the market, with the technology currently generating average revenue per user (ARPU) almost four times the global average. That premium is more a result of the regional mix of LTE connections at present and we forecast just 1.5 percent annual growth in wireless service revenue over the next five years. In this scenario, LTE is more about securing higher-value customers than accelerating market growth."